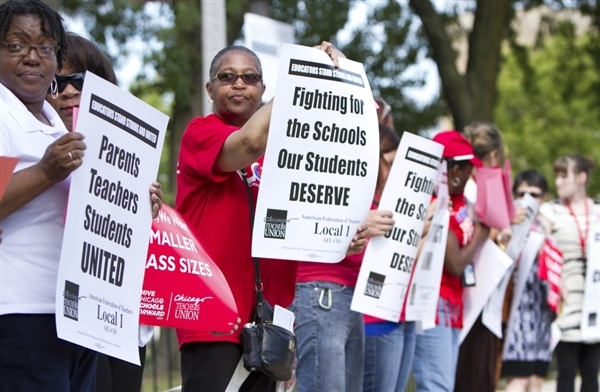 Nearly 30,000 teachers and school staff went on strike today in Chicago. What does this have to do with Schools as Ecosystems? Our mission at Schools as Ecosystems is intellectual: we want to change the way people look at schools. What’s become clear to many, including our friends at Gotham Schools, is that the Chicago strike is more a battle of ideas– an intellectual battle– than a financial one. Will teachers, parents and communities control their children’s school environments, or will these school ecosystems be turned over to profit-minded developers? Will state and municipal governments continue to starve their most depleted schools of funding, or will they give those schools and their students the infusions of resources that they desperately need?